Vermeersch’s color gradients are the result of a meticulous and almost mathematical process by which the artist becomes a kind of human printer – blending paint into a smooth and seamless surface he conceals any trace of the labor involved in the making of the painting. 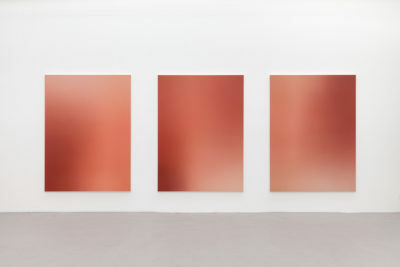 Behind their seemingly straightforward appearance, these paintings are the complex condensation of an ancient technique along with the painterly attempt to render the interpretation of a photographic source. Through this complex process of transformation and filtering, Vermeersch’s paintings liberate themselves from objective referents and allow the viewer the intense sensory experience created by the all-over. Between abstraction and figuration, between control and letting-go, from the wall to the canvas, from prints on paper to painted marble slabs, Pieter Vermeersch’s work expands to simultaneously occupy time and space with equal measure and refinement.